The bridge that was destroyed in a massive mudslide in Fernie, B.C., has been temporarily reconnected, giving 600 campers access to the Fairmont Hot Springs Resort once again. A temporary road that reconnects the campgrounds to the resort was put in place around 2:30 p.m. local time. The campgrounds and resort are separated by the Fairmont Creek. Lorree Duczek, a spokesperson from the Regional District of East Kootenay, told CTVNews.ca that the road will be open for the next two to three days. Then the campgrounds will be closed and a permanent bridge and road will be put in place. On Sunday a mudslide wiped out the bridge connecting the campground to the main resort, stranding hundreds of campers. Duczek said that during the entire time the Columbia Valley Emergency Program had continuous communication with the campers. After the bridge was blown out, some families were separated, including parents from their children, said Duczek. However, resort staff jumped in to make sure the children were taken care of, she said. Duczek said she was shocked by the magnitude of the debris left from Sunday’s mudslide. “The size and scope of the debris field is staggering,” she said. Aerial shots of Fairmont Creek after the slide showed it littered with uprooted trees and boulders, and covered with slick brown mud. The mudslide hit around 4:15 p.m. local time, and forced the closure of nearby Highways 93 and 95 in both directions. Those highways have since been reopened. Earlier on Monday, one person had to be rescued via helicopter as a result of the slide. The slide also forced the closure of the high-end resort and golf course, and caused extensive damage to the resort buildings and several neighbouring houses. During the peak of the incident over 350 people were evacuated from their homes, said Duczek. Many sought refuge at the nearby Windermere Community Hall which was temporarily turned into a makeshift reception centre. 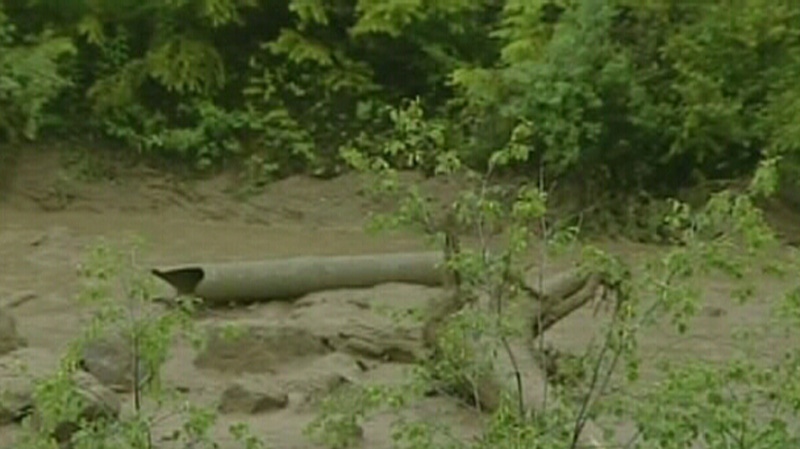 Duczek said the emergency program believes the mudslide was caused by heavy precipitation which caused debris upstream to create an earth dam. Water and more debris built up behind the dam, which finally burst Sunday afternoon. 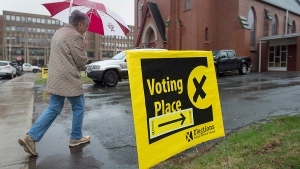 “When it let go late yesterday afternoon, the force sent trees and boulders through neighbourhoods, at one point sweeping vehicles and a large propane tank downstream,” she said. On Sunday a geotechnical engineer and a representative from the province’s water stewardship branch conducted an assessment of the creek to see if there were any more blockages. The two conducted an aerial assessment of the region and saw no issues of concern, said Duczek. She said Monday’s focus will be on clearing the creek of any debris to ensure that water remains in the creek channel. 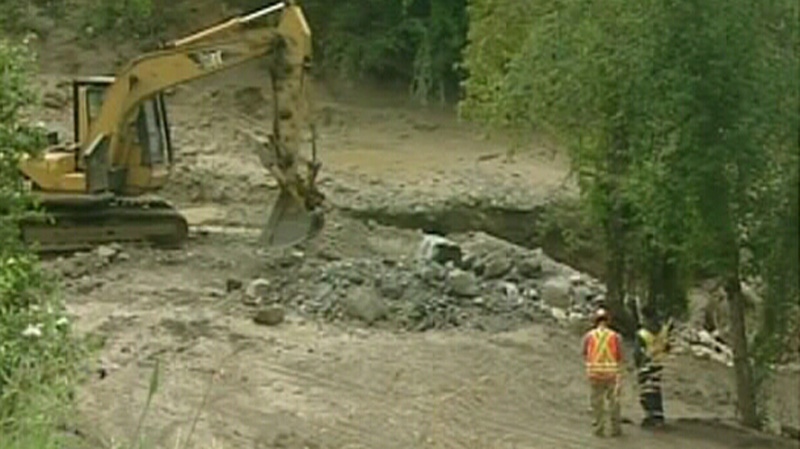 Last week, a much larger and more deadly mudslide hit the hamlet of Johnsons Landing on B.C. 's Kootenay Lake. A father and his two daughters, as well as a German tourist, were caught in the slide. On Monday, a second body was found in the debris. On Sunday night rescue crews located a body believed to be that of the father. Crews have given up hope of finding any survivors, and have said they are now focused on recovery as opposed to rescue. The massive slide, which was up to 100 feet deep in some places, wiped out three homes as it made its way from the mountainside above the community, down to the shores of Kootenay Lake. 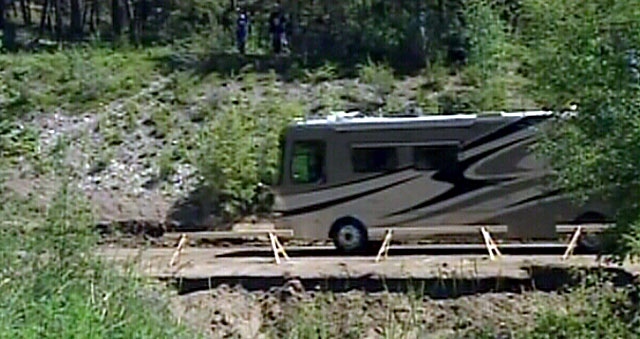 A recreational vehicle travels along a temporary access road, leaving the campgrounds at Fairmont Hot Springs Resort following a landslide that took out a bridge, trapping campers. July 16, 2012. 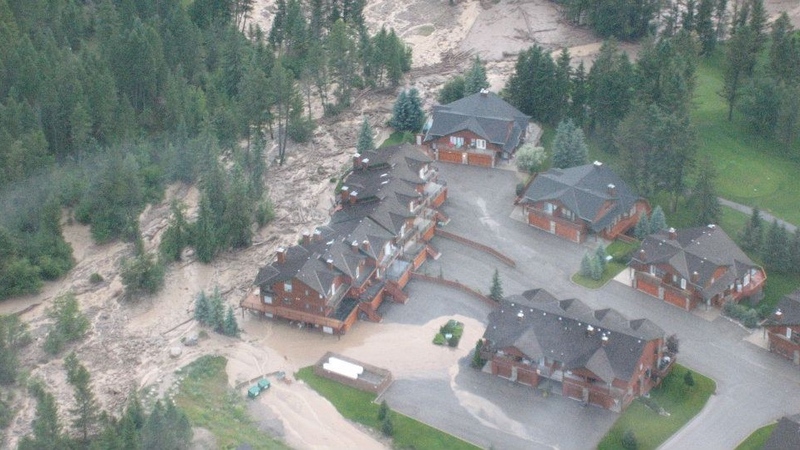 A surge of mud, trees and rocks rolled down the mountain and swept through a creek bed in Fairmont Hotsprings Resort in southeastern B.C.